Veterinary dentistry is rapidly advancing! There are six principle areas within the veterinary dentistry discipline. Each of these six areas of veterinary dentistry are rapidly growing with advances in techniques and materials. Periodontal disease is the most prevalent disease of all diseases in small animals. Periodontics is more commonly studied in veterinary dentistry than all other areas. 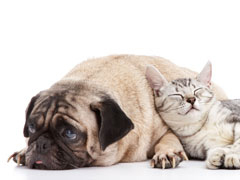 Many new periodontal therapies are available for pets today. Oral surgery is the second largest aspect of our practice. It involves the removal of teeth, foreign bodies, the excision of tumors, the elimination of traumatic occlusions, the repair of jaws and palatal defects. Endodontics involves the treatment of nonvital (dead), vital and dying teeth. Root canal therapy and vital pulpotomy are the most routine endodontic treatments provided. Apexification, apexogenesis and surgical retrograde root canal therapy are also employed. Restorative dentistry is used to re-establish tooth shape, form, function and to avoid pulp inflammation (pulpitis). Prosthodontics involves the fabrication and installation of bridges and crowns for the retention of dental function and to protect the dentition. Orthodontics involves the treatment of malocclusions or abnormal bites. There are numerous myths about the need for teeth, problems that may develop as a result of oral and dental disease, and with regard to our companion animals' perception and experience of pain associated with these problems. Many animals lost teeth to dental disease or from extraction, when treatment options to save these teeth were available. I hope to offer this site as a resource to individuals looking for treatment options! It is my hope to provide useful information to eliminate the myths, and to eliminate some of the misconceptions about veterinary dentistry and oral surgery. It must be 100% clear, that a diagnosis is needed prior to treatment. Dental radiography and periodontal probing are the most fundamental diagnostics available. It is not possible to make a diagnosis if dental radiographs are not taken. Dr. Kressin encourages every veterinarian to purchase dental x-ray equipment and to obtain formal training to develop the required skills for taking and for evaluating dental radiographs. There is a "learning curve" when implementing new technology, however, the rewards for your patients, clients and your practice are clearly worthwhile! CT (cat scans) and MRI imaging, as well as, rhinoscopy and surgical biopsy are helpful tools we can provide for companion animals. Without a diagnosis, optimal treatment plans are nearly impossible to formulate. Myths and misconceptions in veterinary dentistry.